Environmental regulations are the main driver in reducing these emissions worldwide. Although until recently ECA zones were limited to a few areas, the IMO has now decided to limit SOx emissions worldwide and by 2020 all newbuilds will have to comply with its new regulations. The challenge for the shipping industry, however, is not only to comply with the IMO 2020 sulfur cap but also to catch up with the planning of the regulation by identifying and implementing the solutions that are available to enable regulation-compliant ships to be designed and built over the next three years – and this needs to be achieved now, with the shipping industry currently in the middle of a crisis. Investment and operational costs are critical parameters that need to be considered. The answer to the problem needs to be based on a long-term perspective – the industry needs to be two steps ahead of the regulations. There are several approaches that can be adopted to reduce emissions, one of the most promising being the use of liquefied natural gas (LNG) as fuel. This approach is compliant with existing and upcoming norms: SOx emissions can be reduced by 100 percent, Nox by 85 percent, particulates by 98 percent and carbon dioxide by 20 to 25 percent. Moreover, LNG is becoming increasingly available, with infrastructure being developed in all the major worldwide ports and international oil companies expanding and improving their product and service offerings in LNG fuel. The technology for the use of LNG is already established, with about 100 ships currently running on it and about another 90 LNG-fueled ships on order. And, of course, LNG has been used for years as a fuel by methane carrier vessels. It is also a cost-effective alternative fuel: investment in the technology may be higher than in older oil technologies but the operation of LNG-fueled vessels results in considerable savings over the use of marine diesel oil, while further progress is being made in reducing LNG transformation and logistics costs compared with the cost of continuing to use heavy fuel oil (HFO). GTT is now strongly established in the field of LNG fuel, based on the company’s 50 years of history and its invention of membrane systems, and about 400 LNG carriers are equipped with GTT technology, typical tank capacities ranging from 100 cubic meters to 45,000 cubic meters. 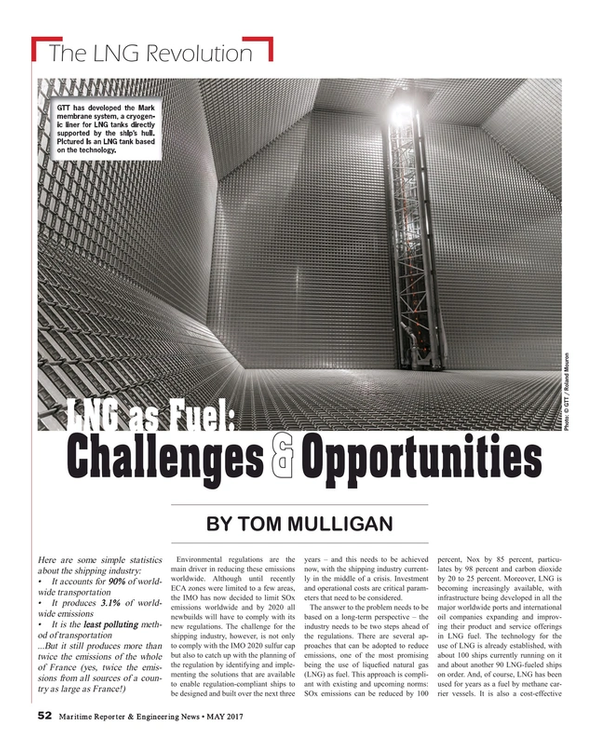 The company is pursuing a policy of assisting in the development of the links that are needed to make LNG as fuel a commodity product by concentrating on improving the required technology as well as developing the industry’s infrastructure; and by increasing knowledge and awareness of LNG use practices and the safety issues involved. GTT’s strategy, therefore, as a ‘technology pusher’ is to reduce the cost of new investments and improve operational costs through the development of newbuild and retrofit solutions for container vessels; to optimize the space on board LNG-fueled cruise ships to enable more passengers to be carried; to develop cost-effective solutions for bulk carriers; and to develop a ‘lean’ bunker barge design to standardize the LNG bunkering market. The company is also focused on developing an industry scheme in which it is teaming up with technology providers, ship designers, shipbuilders and shipowners and operators to enable membranes to be manufactured in any geographic location and to establish a network that promotes and facilitates the installation of LNG fuel systems across the maritime sector. One example of this is its joint development project with ABS, Arista Shipping, Deltamarin and Wärtsilä to bring LNG-fueled vessels into shipping’s mainstream; another is the PERFECt Piston Engine Room Free Efficient Containership based on either combined gas and steam (COGAS) technology as jointly developed by GTT, CMA CGM and DNV GL or on an electric engine system combined with LNG turbines. Finally, the third part of GTT’s technology strategy is to validate in practice the theory of LNG as a fuel by developing industry knowledge around LNG and by being able to validate LNG behavior in marine applications, including determining holding times, boil-off gas (BOG) generation profiles, and operation in static and mobile modes. An example of how the company is moving its technology forward is its cooperation program with Hamburg University and DNV GL to develop a membrane that can adapt to the very large deformations that occur during collision or grounding incidents without losing its tightness and performing poorly. LNG is becoming an important fuel for maritime applications, and the shipping industry is now at a turning point where industry players are providing technologies and solutions. Nevertheless, in a context where charter rates are historically low, shipowners are still reluctant to invest to retrofit their existing fleet or to order LNG-fueled newbuilds. However, with IMO regulations coming into effect in the near future, and further regulations to follow 2020, the regulatory scene will be even more restrictive and will push the industry into choosing long-lasting solutions rather than short-term alternatives. Thus, the major players expect to see LNG-propelled ships comprising 20 percent of the global fleet in the following decade, making this fuel one of the most promising alternatives available to the marine sector in moving towards a greener shipping industry.